A special thank-you to owner Pat Dresser and Handler Christine Dresser for seeing this girl reach her potential!! Flash!! Abby awarded Best of Breed at the prestigious Wesminster Kennel Club's 2001 shows under esteemed judge Mr. Edward B. Jenner! 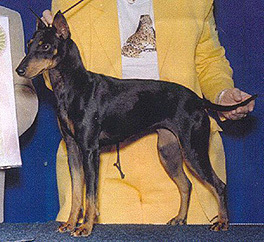 With Multiple Terrier Group 1sts and a Best in Specialty Show to her credit, "Abby" finished 2000 as the #1 Standard Manchester Terrier All-Breed. 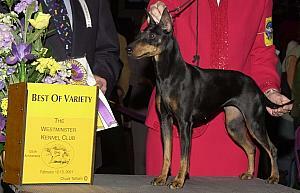 "Abby" finished 1999 as the #3 ranked Standard Manchester Terrier in the United States. "She is Beautifully made. She has good use of herself on the move with a handsome head, eye and ear. She looks like a Manchester and acts like a Manchester......She was perfectly beautiful going and from the side. She had a perfectly beautiful outline and lovely to go over with a lovely head, eye and ear."